Turn your feet into trampolines and defy gravity with Moon Shoes, the original toy mini trampolines for the feet. Kids can leap higher than ever as they improve coordination and balance. Made of quality high-density plastic with adjustable Velcro nylon straps and sure-footing, non-skid soles. Fits shoe sizes up to men's size nine. A giant leap for your child's athletic balance and coordination. With Moon Shoes, kids have incredible fun as they jump with anti-gravity effects while developing balance and coordination. 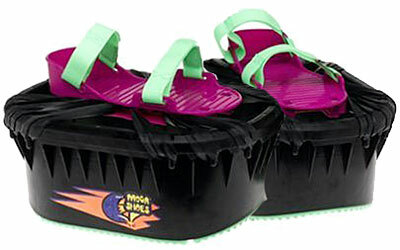 Moon Shoes feature a self-centering shoe platform with non-skid grip surface for sure-footed, high-bouncing thrills.